Forgetting password happens for everyone and if you want to retrieve a new password probably you will go and click Forgot password link on the website (or) blog. Then you will receive a url to reset your password. What about if you want to customize the email you send to users to reset their passwords? With this plugin you can customize your own messages (or) greetings or simple instructions for users safety regarding their accounts or anything else. You must be admin of the website or blog to activate this plugin and customize emails with this plugin. 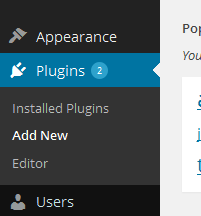 Manually download Custom Forgot Password Mail zip file from wordpress plugin repository. Click Custom Forgot Password Mail to get started. This is the plugin index, this is where you configure your mail contents. If you enter %username% it will be automatically converted as username in email and also %reseturl% will be automatically converted as reset url. You must enter %reseturl% in the mail content. Otherwise users will not be able to reset their password. We are team of trained professionals with hands on experience in web development. We have been on this industry for about 6 yrs and satisfied many customers on their web requirements. Our goal is to provide high quality products on affordable cost on agreed time.